It is always nice to see games running on the latest hardware. It was one of the biggest attractions at Nvidia’s unveiling of its GeForce RTX 2080 Ti. However, hardware manufacturers only want to show their products in the best possible light. Many, including myself, were curious as to how well the card performed outside of the highly controlled environment of an Nvidia keynote. Thanks to a video from German website PC Games Hardware, we actually get to see a glimpse of a 2080 Ti running a demo of Shadow of the Tomb Raider with RTX enabled in 1080p. The results were surprisingly unimpressive. A FRAPS overlay displayed the frames per second which fluctuated widely between 30 and 70 fps. The frame rate would increase significantly when the card did not have to render environments, like when looking at a wall. However, the average rate while running around in the world was only 30-45fps. This low performance is especially surprising considering Nvidia CEO Jensen Huang bragged about the card’s ability to run at a “silky smooth” 60fps in 4K. This might be achievable with fully-optimized code, but it does not appear to be the case with this early demo. 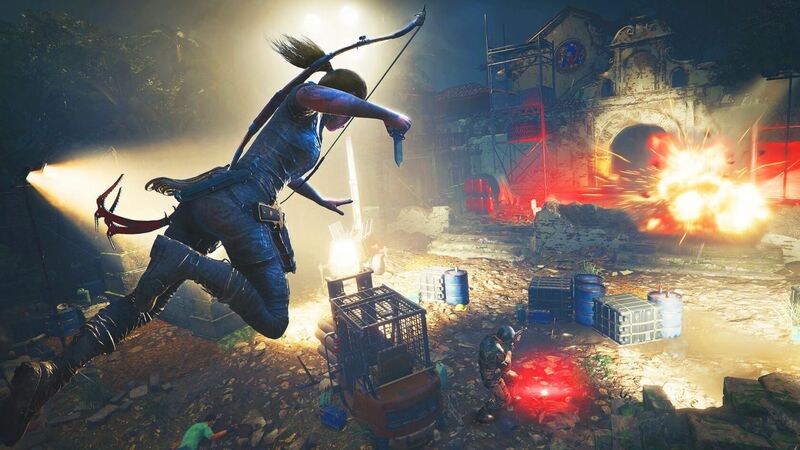 Indeed, after PC Games Hardware published the video, Tomb Raider developers took to Twitter to explain the low frame rate. The devs did not mention how far “post-launch” the update would be. However, since some parts are already implementing RTX, including the portion Huang showed at the keynote, the patch will probably be close to follow. Of course, Lara Croft’s next chapter hits shelves on September 14 — six days before Nvidia’s 20-series cards arrive on the 20th. So the optimizations might already be available by the time you’re plugging in your shiny new GPU. That must have been embarrassing, just like that video that was shown, where Lara dies about 10 times. I mean who even would show such poor game-play to anybody? Roman Architect and JaredTheDragon like this.
" “As a result, different areas of the game have received different levels of polish while we work toward complete implementation of this new technology." This is indeed a demo but I'll believe it when I see it. They need to go from sub 40 FPS 1080p to 60 FPS 4K like Nvidia claimed. You are talking about more than a 400% performance gain in ray tracing from "polish" as the dev puts it. That's usually not on the level of polish, it's more on the level of "our RT code needs to be completely re-written" or "our hardware is completely inadequate". This isn't the first report of poor RT performance either. Currently, I'm waiting to reserve judgement for these performance issues. Given the pricing, people expect these to do 4K 60FPS with RT on at the least. Eugenia, orondf, That Dude There and 9 others like this. Pre-released game on pre-released card. Nobody here will be surprised the performance is sub par, especially on first implementation of a new tech. We'll see if Nvidia can up the performance but IMO there's a 0% chance that a AAA game will implement more than a token amount of ray tracing at 4k/60fps. I'll be looking forward to the TS review. Charles Olson, SantistaUSA, drufense and 4 others like this. Personally I don't see much difference with RTX on vs non-RTX demos of the same scene. But 30fps on 1080p for a card of 1600$ is a joke. I would agree 30 fps on 4k, but this is laughable. We need more FPS not shadows. Charles Olson, ForgottenLegion and JaredTheDragon like this. Charles Olson, SantistaUSA and JaredTheDragon like this. Realtime Raytracing is a gimmick. Hopefully it won't work on too many people, and AMD shouldn't even bother with this yet. It's almost as bad as jumping from the 1000 series naming to 2000, or changing "GTX" to "RTX". Pure marketing decisions, sans any real value to them. No 2000-series card will be twice as fast as a 1000 series card of the same subset. Charles Olson, ForgottenLegion and wiyosaya like this. Realtime Ray Tracing is something many people who have been into computer graphics have been awaiting for a very long time. Many years ago I played with some rendering apps and noticed how much a difference ray tracing made on renders vs other lighting methods. I wouldn't call it a gimmick unless we aren't ready to get it with good performance yet due to hardware limitations. How can you not see the difference, glass in particular looks real, reflections alone are worth it, shadows are really meh, but room lighting is like day and night, that drowned out tinted room looked perfect shadow wise and in games where shadows play a part in rogue like player behaviour it will be a major deal. SantistaUSA, MonsterZero, ForgottenLegion and 1 other person like this. The 20 series is 50/50. Maybe it will impress, maybe it won't. Remember that it's Nvidia's interest to show this tech in it's best light. There's no guarantee that what was shown in the presentation is what you are going to get. Nvidia's implementation is really a rasterization hybrid with denoising applied to clean things up. It may look decent at 1080p as we've seen in the presentation but the missing details could be very apparent at 4K if current product can run at that resolution. Love how people blame the card when it's not the card that's the issue, it's a game issue so it's on the dev to optimize the software. All what was shown was demo stuff, to get you drawn in. And it worked. Then some game that isn't even fully optimized, all of a sudden the card cant do what nvidia said LOL. There is always going to be some early struggles when it comes to new hardware n software/drivers. Always has been and always will be. 10 series went through some struggles early on but turned out just fine. Actually we don't know what the cause is. You are quick to dismiss what it isn't when you have no idea yourself. Where you just throw out a load of possible causes. We need a side by side of an optimised experience for both. Not just one-sided pretty demos. Charles Olson, Sikirash, wiyosaya and 1 other person like this. Last time I skipped a gen was the gtx 500 series. Already having major doubts about these new cards and as insane as the prices are gonna be, I'll probably skip this gen. Very unimpressive so far. Also Nvidia's business practices have always been among the shadiest in the industry imho. Just sayin. wiyosaya and ForgottenLegion like this. I doubt they will increase performance to go from 30fps@1080p to 60fps@4k without having to compromise graphics which then defeats the purpose of ray tracing. If they manage it I will be impressed even though I'm not all about graphics and this GPU and ray tracing isn't for me and my budget. Ray tracing implementation in games will be akin to Physx and 3D Vision adoption. It's a nice addition but I'm willing to bet the hardware just isn't there yet nevermind getting enough devs on board to force the market in this direction. Hopefully AMD can bring out a competing card with 90% the performance for half the cost. These prices are out of control. Eagerly waiting real world 2080 Ti performance. numbers. Colour me unsurprised - I'd expect 1080p with ray tracing at approx 60 fps by the time the card is released. 60 fps at 4k will be without all the bells and whistles. A 1080TI sometimes struggles to maintain 60fps in ultra at 1440p (I know because I have one) - so whilst there is a 10x improvement in ray tracing in the 2080 Ti there is only a small boost in cores for the grunt work. They don't make newer cards with regressive performance. Just need to wait for the games to take advantage of the new technology. Besides, it's not an optimized game code yet. Also, this need to be compared with the 1080Ti for relative performance issues. And also it will useful to know when and how did that German website got a hold of the RTX 2080 Ti. When was it run to see the demo? I see the date of publishing was August 21, but when was the demo run? Was it a finished retail card? Did any other hardware reviewers got a card for review yet? AMD have their own implementation on the RadeonPro GPUs which mixes real time raytracing with traditional rasterization-based rendering using the Vulakn 1.1 API. They also have Radeon Rays 2.0 which is open source (available on Github) built using the OpenCL 1.2 standard. Nvidia's RTX API will run through DirectX (MS's DXR API which will be included in an DX12 update). AMD is using the async compute engines to achieve this (which are great for compute heavy workloads), although it's probably not as good/powerful as NVidia's dedicated cores. Go watch Battlefield V demo again, look at the bus windows. Dice had 2 weeks to implement RT. All things considered that is damn good. SotTR I wouldn't assess from as they went to Twitter stating it is extremely unoptimized running extra Ray's than needed.